Kaye's Maid Service in Columbus, GA is dedicated to performing excellent housekeeping services. Our cleaning crew is small in number, but it is this aspect that allows us to have a friendly down-to-earth approach. This aspect, combined with years of experience, results in a reliable and professional experience. We are an independently owned and operated cleaning company with roots in this community. All our employees are extensively trained and pass a background check. They must meet our security standards and qualifications, and show a willingness to take pride in their work. We are not a nationwide franchise or a revolving-door business of part-time cleaners. You can be confident that your space and possessions are secure, and will be maintained with the highest degree of integrity. 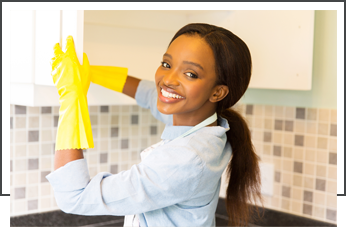 All of our maids are trained by Maid Training Academy, the largest online training school for residential maid service professionals. This allows us to deliver the highest-quality maid services possible. If you have had a bad experience with nationwide franchises, our independent company is your solution! Our friendly and knowledgeable staff is available from 8:00 AM to 6:00 PM. We can be reached by email or phone. Be assured that you can contact us with any questions or concerns whenever they arise. Our company is licensed, insured, and bonded for your protection. This is important as many businesses offering cleaning or housekeeping services are not covered in the event of an accident or mishap on your property. We back up our services with a 100% guarantee. We are bonded and insured, and background checks are run against each person in each team we work with. This is one of the major benefits associated with using our business over an individual who may claim to take these precautions but does not. What Are Your Move In / Out Services? Our move in / out cleaning is designed to prepare an apartment or house for a new tenant. There's typically more room to be vacuumed, more baseboards to be detail cleaned, more cabinet and drawer space to be cleaned, light fixtures, etc. We include inside the fridge and inside of the oven cleanings as well. Do You Offer Deep Cleaning? As far as deep cleanings go, you'll be pleased to know that all of our cleanings are deep cleanings. The only things that are considered additional are cleaning the inside of the fridge, inside of the oven, and interior windows. Do I Have to be There When the Cleaners Arrive? No. You can leave a key for us to get in, and we'll handle it from there. Some of our clients leave their key under a mat, in the mailbox, at a front-desk, or somewhere else out of sight. If you book online, just remember to tell us where the key will be in the instructions; otherwise just give us a call. Who's Responsible for the Supplies? We bring all of the necessary supplies, including the vacuum machine and paper towels. If you have a preferred product to use (e.g. for wood floors) just let us know. Are You Legal to Work in the Unites States? Do You Have a reliable Car? Yes or No? If so when? © Kaye's Maid Service Inc.